The UK hosts seven of the world's biggest offshore wind farms, while Denmark and Belgium round out the top 10. Power-technology.com lists the 10 largest offshore wind farms in the world. London Array wind farm, located in outer Thames Estuary, UK, is currently the world's largest offshore wind farm. Image courtesy of London Array Limited. The 500MW Greater Gabbard, which is the second largest offshore wind farm in the world, is also located in the UK. Image courtesy of Department of Energy and Climate Change, UK. Bard Offshore 1, in the North Sea, is Germany's largest offshore wind farm. Anholt, Denmark's largest offshore wind farm, is also the fourth largest in the world. Siemens press picture. The Walney offshore wind farm currently consists of 102 Siemens 3.6MW wind turbines. Image courtesy of Mark. Belgium's first offshore wind farm, Thorntonbank, is the world's sixth largest offshore wind farm by installed capacity. Image courtesy of REpower Systems. Sheringham Shoal wind farm located off the Norfolk coast, UK, is the seventh largest offshore wind farm in the world. Image courtesy of Harald Pettersen/Statoil. The 300MW Thanet offshore wind farm in Kent, UK, is the eight largest in the world. Image courtesy of Vestas. Centrica's 270MW Lincs offshore wind farm was inaugurated in August 2013. Image courtesy of Siemens plc. 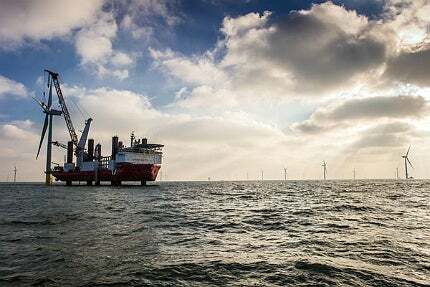 Horns Rev 2 is Denmark's second largest offshore wind farm. The 630MW London Array offshore wind farm located in the outer Thames Estuary, UK, is the biggest offshore wind farm operational to date. The London Array also ranks as the world’s sixth largest wind farm overall. The array was developed by a consortium of Masdar, E.ON and DONG Energy. The offshore area of the wind farm is approximately 100km² and includes approximately 450km of cabling. Phase one encompasses 175 turbines supplied by Siemens, an onshore substation and two offshore substations. The first turbine was installed in January 2012 and the last turbine was in place within 12 months, to be officially inaugurated in July 2013. The wind farm cuts 900,000t of carbon dioxide a year at its current capacity. The 500MW Greater Gabbard offshore wind farm, which ranks as the world’s second largest offshore wind farm by installed capacity, is also located in the UK. The wind farm is situated 25km off the coast of Suffolk, North Sea. The Greater Gabbard wind farm is jointly owned by Scottish and Southern Energy (SSE) and RWE npower (RWE). It was originally launched by a joint venture of Airtricity and Flour. The wind farm comprises of 140 turbines rated at 3.6MW each. The turbines are installed on steel monopoles dug 24m to 34m deep in the sea. Offshore installations were carried out by Seajacks’ Leviathan vessel. The turbines were supplied by Siemens. Bard Offshore 1, located 100km north-west of Borkum Island in the North Sea, is currently the third largest offshore wind farm in the world. The wind farm covers an area of 60km² with 80 turbines rated at 5MW each. Bard Engineering developed the wind farm. The last turbine was installed by the end of July 2013, marking completion of the wind farm’s construction. The wind farm was officially inaugurated in August 2013. It currently supplies 80% of Germany’s offshore power production. The turbines of Bard Offshore 1 contain more than 120,000 tonnes of steel. The 200km shore connection of the German wind farm is touted as the longest in the world. The first 40 turbines of the wind farm were installed in a record seven months, by using a variety of jack-up and support vessels. The 400MW Anholt offshore wind project is currently the fourth largest offshore wind farm in the world and the largest offshore wind farm in Denmark. It was officially inaugurated in September 2013. Danish utility company DONG Energy owns the majority stake (50%) in the Anholt wind project and also operates the wind farm. Two pension fund companies, Pension Danmark and PKA, respectively hold 30% and 20% stakes in the project. Anholt consists of 111 Siemens wind turbines rated at 3.6MW each. The rotor diameter is 120m. The foundations, towers and turbines were developed indigenously in Denmark. The wind farm supplies for nearly four percent of Denmark’s total power demand. DONG Energy operates Walney, the fifth largest offshore wind farm in the world. The wind farm is located in the East Irish Sea, 15km west of Barrow-in-Furness, Cumbria, UK. The wind farm, built in two phases, has an installed capacity of 367.2MW. The two phases of the offshore wind farm were grid-connected in January and November 2011. Commercial operation of both the phases started in early 2012. The Walney wind farm comprises of 102 Siemens 3.6MW wind turbines, 51 installed in each phase. The wind farm is planned to be extended by 120 new turbines, which will increase its installed capacity beyond 1,000MW. Thornton Bank, Belgium’s first offshore wind farm, is located in the North Sea at water depth up to 30m about 30km off of the Belgian coast. The wind farm was developed in three phases and has an installed capacity of 325.2MW. It currently ranks as the sixth largest offshore wind farm in the world. The first phase of the offshore wind farm owned and operated by C-Power was commissioned in 2009. The second and third phases were commissioned in 2013. Thornton Bank 1 is installed with six REpower 5MW turbines. Thornton Bank 2 comprises of 24 REpower 6.15MW turbines. Thornton Bank 3, commissioned in September 2013, also consists of 24 REpower 6.15MW turbines. The wind farm has the capacity to supply electricity for around 600,000 people. Sheringham Shoal wind farm, located 17km to 23km off the Norfolk coast in Greater Wash, UK, with a nameplate capacity of 317MW, ranks as the world’s seventh biggest offshore wind farm. The wind farm is built in a diamond-shaped offshore layout measuring 35km² in area. Sheringham Shoal consists of 88 turbines of 3.6MW each. The turbines rest on monopole foundations measuring 4.2m to 5.2m in diameter. The operational base of the wind farm is at Wells Harbour on the Norfolk coast. Two offshore substations and one onshore substations form part of the project. Scira Offshore, a joint venture of Statoil and Statkraft, built the Sheringham Shoal wind farm with an investment of approximately $1.8bn. Statoil is currently the operator of the wind farm, but Statkraft will take over operations from January 2014. The Thanet Offshore Wind Farm, located 11km offshore of Thanet, Kent, UK, has an installed capacity of 300MW. The wind farm is owned and operated by Vattenfall and is situated in water depths of 20-25m covering an area of 35km². Construction of the £780m ($1.25bn) wind power project began in 2008 and was completed in 2010. Thanet Offshore Wind Farm commenced operation in September 2010. It is currently the eighth largest offshore wind farm in the world. The wind farm consists of 100 Vestas V90 3MW wind turbines. The turbines are installed with a 500m distance along rows and 800m distance between rows measure. Each turbine measures 115m high at its highest points. The Lincs wind farm owned and operated by the British company Centrica is currently the ninth biggest offshore wind farm. The 270MW wind farm, located eight kilometres off the Lincolnshire coastline, was officially inaugurated in August 2013. The 75 Siemens 3.6MW turbines of the Lincs wind farm generate renewable energy for more than 200,000 homes. Construction of the wind farm started in 2010 and the last turbine was put in place by 31 March 2013. The turbines were installed in ten to 15m of water. Centrica owns 50% of the Lincs wind farm, while DONG Energy and Siemens Project Ventures own 25% each. The wind farm is designed to operate at least for 20 years before decommissioning. Horns Rev 2, with an installed capacity of 209MW, currently ranks as the tenth biggest offshore wind farm. Horns Rev 2 was the biggest offshore wind farm in the world at the time of inauguration in September 2009. The DONG Energy-owned wind farm was built as an extension to the 160MW Horns Rev wind farm. Horns Rev 2 consists of 91 wind turbines rated at 2.3MW each, supplied by Siemens. The combined nameplate capacity of the two Horns Rev wind farms is 369MW. Horns Rev 2 was also the first offshore wind farm with an accommodation platform. The offshore platform provides accommodation to 24 on-site employees and connects to the transformer platform through an outer gangway. Can Europe’s infrastructure support its offshore wind boom? Offshore wind has the potential to become a major source of energy, but can Europe’s infrastructure support this offshore wind boom? Despite a global recession, the wind energy market has grown exponentially in recent years.